As Budapest recovers after violent protests on Friday night calling for the resignation of Prime Minister Ferenc Gyurcsany, a spokesman for Hungary's police force says he is not ruling out riots could continue in the capital. A peaceful demonstration of around 200,000 people marking the anniversary of the 1848 uprising against Habsburg rule turned to violence as opposition supporters threw eggs and coins at the city's mayor. They were later joined by far-right activists. With cars ablaze and police using tear gas to break up the crowds, the clashes were highly reminiscent of riots last autumn, when a leaked tape revealed the prime minister had lied in his election campaign. This time the trigger was different. Police said they had detained Gyorgy Budahazy, the man suspected of organising last year's riots. Authorities are worried street protests are becoming a trend. 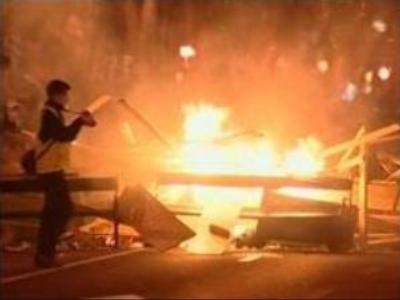 Hungarians are worried that the protests will be repeated until the prime minister resigns.